With Sherlock Holmes now transformed into another idiot action hero in those bloody Guy Ritchie movies, it's worth remembering the character as he was written by Sir Arthur Conan Doyle. I seem to remember that there was a moment in film history when Sherlock Holmes had been in more films and TV series than any other fictional character. It's quite possible that the record still stands. The majority are straight adaptations of actual Conan Doyle stories (my money's on Hound of the Baskervilles as the most popular), but come the 70s the gameplaying with the character began. This was not always good news, but did give rise to one of the geatest of all Holmes movies in Billy Wilder's The Private Life of Sherlock Holmes. But coming in a close second is Bob Clark's 1979 Murder by Decree, which pre-dated Alan Moore and Eddie Campbell's From Hell and featured Christopher Plummer as Holmes, James Mason as Watson and Frank Finlay as Lestrade in a fascinating riff on contemporary conspiracy therorising that pitted Holmes against none other than Jack the Ripper. There's also a strong supporting cast that includes David Hemmings, Anthony Quayle, John Gielgud, Donald Sutherland, and in a bieutifully played early role, Geneviève Bujold. This is a personal favourite here and is one that we will definitely be reviewing. 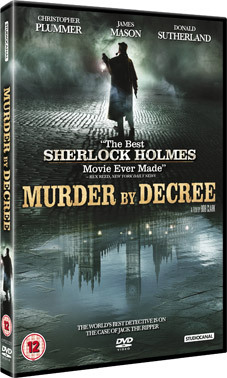 Murder by Decree will be released on UK DVD on 2nd April 2012 by Studiocanal at the RRP of £15.99. Extra features would be great, but unfortunately there are none.